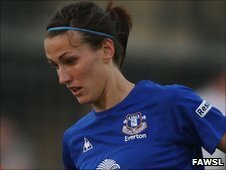 Everton Ladies midfielder Jill Scott says the standard of the women's game has improved since the creation of the Women's Super League. The Blues are down in fourth place this season and Scott says it is down to the competition being much greater. "I think the other teams around us have definitely got better," Scott, 24, told BBC Radio Merseyside. "I think teams have strengthened themselves and there has been a more professional approach to the league." She added: "We've had good performances but at times we just haven't had the results. We knew that if we just kept doing what we have been doing then the results will come. "We showed that [in the 1-0 win] against Doncaster and hopefully we can build on that now." The Women's Super League has an enforced 11-week break because of England's involvement in next month's World Cup finals in Germany. Scott, who should be in Hope Powell's squad for the competition, says the mid-season hiatus has come at the wrong time for Everton after the Blues secured their first win of the season against the Belles last Thursday. "The break has probably come at the wrong time for us but it's nice to end the first half of the season with a win," continued Scott. "Then we can get back together before the second part of the season and hopefully start where we finished off." After reaching the 2009 European Championship final, England have ambitions of reaching the World Cup final but the former Sunderland midfielder says they are not getting carried away. "We'll just look to take it one game at a time," said Scott. "Every game is going to be difficult so it would be good to get off to a winning start. "We just want to progress out of the group, that's the first aim for the team. The girls would love it if England reached the final, but we're looking to progress out of the group first."